He’s produced great record after great record for the past 50 years, and now Alan Parsons has given his legions of fans cause for celebration with the release of a new live album: The Alan Parsons Symphonic Project Live In Colombia. Available in DVD, CD and vinyl formats, the album features a stream of Parsons’ biggest hits, and his band are also backed up by a 70-piece orchestra, making the whole show an unforgettable experience. 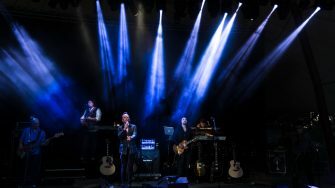 Alastair Greene on stage with The Alan Parsons Live Project.